Comedian Jim Carrey got personal during a commencement speech in Iowa. He tells students "you might as well take a chance on doing what you love"
He jokes about meditation as time "to slack off twice a day for an hour and a half"
(CNN) -- Leave it to Jim Carrey to turn a commencement speech into a show and tell. The actor brought along some of his artwork to share Saturday with the graduates of the Maharishi University of Management in Fairfield, Iowa. And the actor offered the Class of 2014 inspiring words about life and their future. "Like many of you, I was concerned about going out into the world and doing something bigger than myself, until someone smarter than myself made me realize that there is nothing bigger than myself," the "Dumb and Dumber" star said. "My soul is not contained within the limits of my body; my body is contained within the limitlessness of my soul." The funnyman got serious when discussing his father and the things he learned from him. 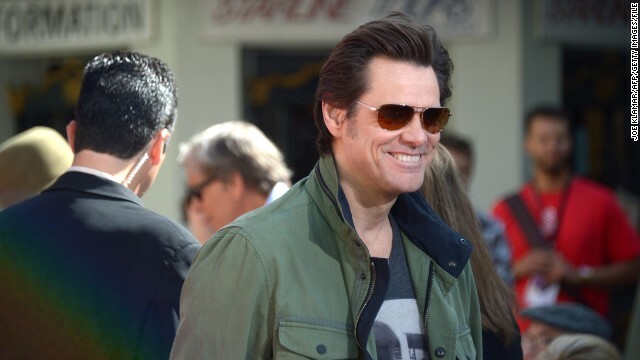 "My father could have been a great comedian, but he didn't believe that that was possible for him, and so he made a conservative choice," Carrey said. "Instead he got a safe job as an accountant." All of that fell apart, the actor said, when his dad lost his job and the family fell on hard times. "I learned many great lessons from my father, not the least of which, was that you can fail at what you don't want, so you might as well take a chance on doing what you love," he said. The speech received a rousing reaction from the graduating students of the institution, which according to its website is a place where "all students and faculty ... practice the Transcendental Meditation® technique." Carrey jokingly thanked, "The trustees, the administrators, the faculty of MUM for creating an institution worthy of Maharishi's ideals of education as well as enabling the students through transcendental meditation and ancient vedic knowledge to slack off twice a day for an hour and a half." He also received an honorary degree of doctor of fine arts during the ceremony.